Green Onyx Cut Onion Shape, semi persicious stone, cut stone, gemstone, Onyx stone, Loose Semi precious Stone, Green Gemstone. 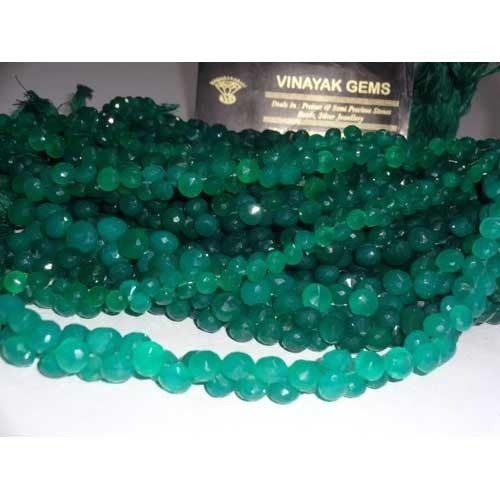 Established in the year 2004, our company, Vinayak Gems is established among the noteworthy manufacturers, exporters, wholesalers, traders and suppliers of the alluring gamut of Semi Precious Stones, Beads & Gemstones. Our product array encompasses Quartz Gemstones, Faceted Gemstones & Tourmaline Gemstones. Our eye-catching gemstones reflect the artistic skills of our professionals. Keeping in mind the current market trends, we process our entire assortment with the aid of cutting-edge technology and the most advanced techniques. Owing to smooth cuts, elevated durability, excellent finish and gleam, our stones are highly acknowledged by our clients across the world. Our company is known for ensuring timely delivery of products in a highly professional way. Our team of professionals has been widely known for its crafting and designing techniques. Their vast domain knowledge enables us to introduce new and innovative patterns of gemstones. That is why, today, customers all around the world appreciate our products because of their beautiful designs, flawless finish and eye-catching designs. We conduct our business in utter compliance with business ethics.